The Non-GMO Project is a non-profit organization created by leaders representing all sectors of the organic and natural products industry in the U.S. and Canada. Its purpose is to offer consumers a consistent non-GMO choice for organic and natural products that are produced without genetic engineering or recombinant DNA technologies. What exactly are GMOs? Genetically modified organisms (GMOs) are organisms that have been created through the gene-splicing techniques of biotechnology (also called genetic engineering, or GE). This relatively new science allows DNA from one species to be injected into another species in a laboratory, creating combinations of plant, animal, bacteria, and viral genes that do not occur in nature or through traditional crossbreeding methods. Contamination risks to seeds, crops, ingredients, and products has been steadily increasing without any standardized set of best practices in use to identify and stop contamination. In 30 other countries around the world, including Australia, Japan, and all of the countries in the European Union, there are significant restrictions or outright bans on the production of GMOs--because they are not considered proven safe. In the U.S. on the other hand, the FDA approved commercial production of GMOs based on studies conducted by the companies who created them and profit from their sale. Many health-conscious shoppers find the lack of rigorous, independent, scientific examination on the impact of consuming GM foods to be cause for concern. According to the USDA, in 2007, 91% of soy, 87% of cotton, and 73% of corn grown in the U.S. were GMO. It is estimated that over 75% of canola grown is GMO, and there are also commercially produced GM varieties of sugar beets, squash and Hawaiian papaya. As a result, it is estimated that GMOs are now present in more than 80% of packaged products in the average U.S. or Canadian grocery store. The Non-GMO Project began as an initiative of independent natural foods retailers who were interested in providing their customers with more information regarding the GMO risk of their products. As the Project evolved, it became clear that in order for the initial vision of standardized labeling to be possible, a 3rd party verification program was needed that would identify products compliant with a uniform, consensus-based definition of non-GMO. With the help of technical consultants FoodChain Global Advisors, and fueled by the passion of a dynamic array of industry leaders, the Non-GMO Project has successfully created a collaborative non-GMO verification program that began enrolling products in the fall of 2008. Working at every level of the supply chain, all the way back to the seeds, the Project's role is to inspire and ensure viable non-GMO alternatives long into the future. Polls consistently show that a significant majority of Americans would like to be able to tell if the food they're purchasing contains GMOs. (A 2008 CBS News Poll found that 87% of consumers wanted GMOs labeled). And, according to a recent CBS/New York Times poll, 53% of consumers said they would not buy food that has been genetically modified. 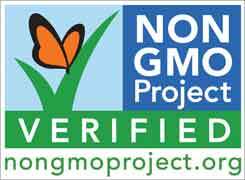 The Non-GMO Project's seal for verified products will, for the first time, give the public an opportunity to make an informed choice. While the work on the Non-GMO Project's consensus-based standard and independent product verification program continues to be incredibly complex, they have succeeded in establishing an industry-wide system for addressing contamination and a "Non-GMO Project Verified" seal that will start appearing on products in stores this fall. October 2010 will be the first ever Non-GMO Month, with a special Non-GMO Day on October 10th. Visit the Non-GMO Project's website at www.nongmoproject.org for a list of products and brands enrolled in the Non-GMO Product Verification Program.